Transportation and accommodations can be frustrating to find for pet lovers in Thailand. Here is what Zala and I discovered on our journey to the opposite end of Thailand. Bangkok Airways is the only airline that will fly 45kg of (Dog+Crate) as checked luggage. Bangkok Airways has always been real great about keeping Zala out of the sun and minimizing her time in a crate the best they can. And as a bonus, I get fed a full meal and as many drinks as I can hold during a 55 minute flight. Meal price is included in the ticket with 21 meal options to chose from ranging from Muslim meals prepared in accordance to Halal rules to gluten free. Unfortunately, only Bangkok Air’s airbus 319 and 320 can transport Zala’s large crate. The ATR 72 is the only airplane that flies from Bangkok to Trat, and it will only accept a 80 cm long x 45 cm wide x 65 cm crate with a max combined weight of 20kg. Bangkok Airways is the only airline that flies from Bangkok to Trat. From Bangkok on down, the journey must be completed on the ground. The cheapest transportation service is the bus. According to a few reviews, individuals have taken cats and puppies in small crates and stowed them below with the luggage. This is not an option for a 70lb Dutch Shepherd. The next option is to rent a car. To my knowledge, there are no car rental options in Trat. Any car rental would need to be returned to Bangkok or Pattaya. This is not great option for those choosing to stay in Trat for a long period of time. The drive is at least 5 hours long. The last option, and most expensive, is a van service. Renting a vehicle with a driver is common in Thailand. You can even rent a songthaew for a day if you wish. The only driver service I found that was willing to transport my big dog + luggage was Bangkok Beyond. My driver (Tony) was waiting for me at the airport with my name on a sign. I had an entire minibus at my disposal. Zala was allowed out of her crate, and she got to hang her head out the window and enjoy the ride all the way down to the bottom of Thailand. I was given complimentary drinks and essentially free rein to ask for bathroom breaks and meal stops as I pleased. If I had not been anxious to get to Trat before nightfall, I may have taken advantage of this luxury. The cost of this van service was 5550 baht. This is a lot of money to pay in Thailand for a simple trip from Bangkok to Trat. But the cost of a plane ticket including all my excessive luggage (Zala) is roughly the same amount as the van service and this was a trip my dog got to enjoy instead of being cooped up in a stuffy box. Your options are a bit more limited in Thailand, but it can be done. 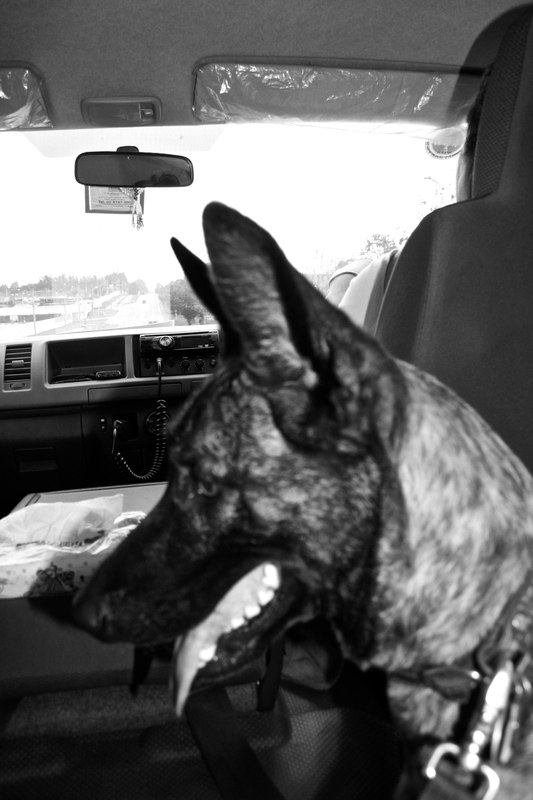 I honestly believe Zala and I enjoyed our van journey more than we ever would by skipping over in a plane.